Vintage Kids' Books My Kid Loves: A Great Giveaway, an Anniversary and News! A Great Giveaway, an Anniversary and News! Thanks for the nice notes and well wishes. I am enjoying some quality time alone with my mother here in Tidewater Virginia. My grandmother had a long, colorful life, and I am lucky to count myself among the people she loved. I wanted to take a moment to recognize that today marks five years of Vintage Kids' Books My Kid Loves. It was July 25, 2007 when I wrote my first post on Why I Built The Boogle House. It's been a great ride that saw my son grow from an infant to a full-fledged elementary schooler. 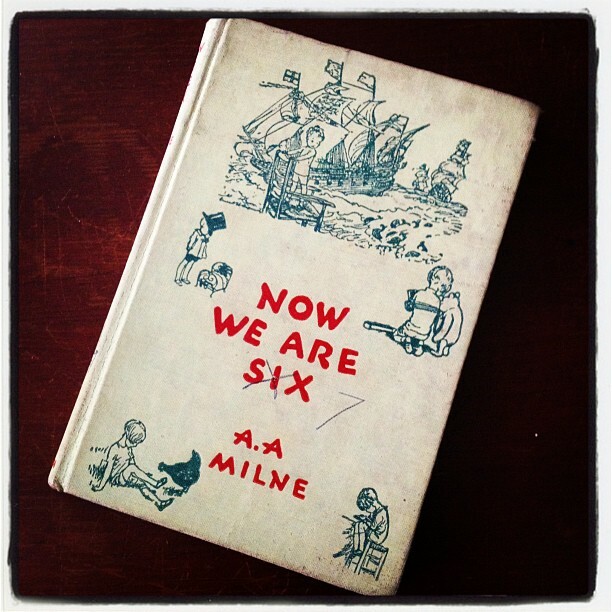 As my aptly vandalized childhood copy of Winnie the Pooh states, "Now We Are 7!" I've enjoyed every minute of sharing the books we've loved with you all, and felt a small victory every time a reader was able to reconnect with a long lost love. Thanks to all who've joined us for even a small portion of the ride. That said, there are going to be some changes here at VKBMKLs. After seven years of staying home with my son, I've decided that it is time for me to go back to work. I've taken a job with a publisher here in Texas, and couldn't be more thrilled with getting back in the game. However, between my own writing and work, that won't leave much time for this blog. But don't fear... I'm making the commitment from here on out to post at least every Monday. I might end of doing more here and there, but rest assured, I'll always be here bright and early Monday mornings to share a book. I'm afraid this also means the end of the Great Monday Give. Though I will still be hosting giveaways occasionally, the weekly gives will stop. Case in point, to celebrate these new beginnings, I have a great give sponsored by the incomparable New York Review Books Children's Collection, the best children's reprint house in the biz. A prize package of four great classics: The Backward Day by Ruth Krauss, Three Ladies Beside the Sea by Rhoda Levine and Edward Gorey, Uncle by JP Martin and Quentin Blake, and Pecos Bill. All you have to do to be entered to win this package of awesome is comment on this post between now and Sunday, August 5 at 11:59 PM CT. A winner will be selected at random and posted the next day. Good luck to all, and in the coming weeks be expecting a surprise awesome interview, more weekly book love, and loads of old favorites to rediscover! Congrats on 5 years and on the new job!!! Wanted to let you know we received our copy of There's a Nightmare in my Closet. It was like Christmas at our house yesterday! Thanks! Congrats on the new job! I look forward to your Monday posts. Congratulations, and thank you for the things you've contributed over the years. I've enjoyed this blog immensely. I'll look forward to Monday evenings here in Dublin. Happy Anniversary! Good luck with your new job! Thank you for the news and updates over the years! I have purchased so many of the books you profiled and my grandchildren love them as much as we did. Best wishes on your new job! But really, it is such a beautiful name, personal bias aside. I would LOVE LOVE to win this collection! Best wishes with the new job and even just a little of your blog will be a delight. Happy blogiversary! And congratulations on the new job. I've read every single post, and my book wish list has quadrupled since discovering your blog. You've greatly expanded my list of favorite authors and books, and constantly amaze me by bringing up more and more I don't know (very hard to do!). I thought of you today as I read "The Cow Who Fell into the Canal" with my daughter; one you introduced me to. I will miss your frequent posts dreadfully, but of course I understand! I look forward to many more Monday discoveries. Good luck at the new job! Ahhh, boo, cry.... You inspire us. Many blessings and much joy for the future! While I am saddened about seeing less at your awesome blog, I am excited for your publishing job! I love working with publishers and authors on a part time (feelance) basis, and I can imagine how much fun it would be to fo it full time. My son and I got a lot of recommendations from your blog, and my newer daughter is benefiting from it now while my son I starting to read mote on his own. This give looks great, and amazingly, we don't have any of those books. Congratulations on re-entering the workforce. I hop it brings as much joy to you as you have to our family in the rediscovering of some books and the perfect introduction to others. We look forward to more regardless of how many and when. Sorry to hear we'll be seeing less of you! But, congratulations and good luck! Congratulations! What an exciting new adventure! Congratulations and good luck to you!! Congratulations on the new job! I excited for you! I have enjoyed reading your blog so much over the last few years, and you have introduced me to a lot of amazing books! Thank you! I look forward to more, even if the posts are infrequent, and I wish you the best in your new endeavors. Congratulations on the new job -- and also on the shift in your life priorities -- and thank you for the 5 years of posts. I came relatively late to this blog, about a year ago, but the reams of books you've reviewed (and I've bought) over the years have made a huge difference in the reading time I spend with my older son, who is almost five now . . . and will surely benefit my little two year old as well. Again, thank you for sharing your impeccable taste and preserving five years of yourself on the net. Very best wishes to you and your family. Checking your blog has been a highlight of my weekdays since discovering it several years ago. You've made me a far more educated thrift store shopper and introduced our family to so many wonderful titles. I'll really miss your frequent posting, but am grateful that you'll still be devoting some time to your blog and enthusiastic followers. Best of luck to you in your new undertakings and thanks again for all the fabulous posts over the years. Hi,I am a new follower. Congratulations on your new publishing job. I will look forward to Mondays now! I have a granddaughter who is three, so I am always looking for quality books for her. Congrats. And best o' luck at the new gig! 5 years is impressive! Congratulations on the new job, that sounds exciting and wonderful. I'm thrilled you'll be keeping the blog alive on a weekly basis- that's fantastic news! I found your blog soon after you started, when I was pregnant with my 4.5 year old son. I've really enjoyed reading your posts. I look forward to your future posts. Thank you for all you've given. I absolutely love Vintage Kids' Books. I am so impressed by the wealth of information you have collected here during the past five years. Best wishes with your transition back to work! Will miss seeing you here more often, but also excited for you and this new chapter opening in your lives. May God bless you and your family. Thanks for all of these years of fun anticipation and literary fun. Such a joy and pleasure. Happy Anniversary! This is my favorite blog--always my first stop when I sit down to browse. I'll definitely miss the daily book goodness, but will look forward to Mondays. Congratulations on the new job--very exciting! And what a fabulous giveaway--we don't have any of those in our collection. Thanks! I haven't visited the blog for awhile, but have always enjoyed it. Good luck with your changes and thanks, as ever, for all the recommendations. I've remembered many childhood favorites to share with my kids. Best of luck on your new life direction - and thanks for the past five fabulous years of books - I've had a fabulous time reading!!! I am new to VKBMKL but have loved reading about good old books. I am looking forward to your Monday posts. Congratulations on the new job! Thanks for all the time you have put into this blog, it has been a big inspiration on choosing books for our home library! Your experice of writing tis blog will surely bring as much to your new job as it has to your readers. Bon continuation & chance from France! congrats on the new job! I will miss your posts. Your blog has had a special place in my heart, and has made my reading time with my son richer. He was 6 when I first came across your site, and is 11 now. I will keep tuning in, even if there is less happening. I'm sure what you will share will be worth my time! I'd love to know more about your new job, if you feel like sharing that info. Thinking good thoughts for you! What an exciting and bittersweet time of changes for you. Happy birthday, anniversary, & new job. The give has been fantastic, but completely unnecessary to the overall awesomeness of your blog, and I look forward to whatever you have time to share. Oh, happy blogaversary! And please enter me in the giveaway! What a wonderful opportunity! Congratulations on the new job and the anniversary. And throw my name into the giveaway hat, please. Always love checking in to see something new to me, or well loved. Good luck! Congrats on the new job, and know that will miss your daily posts but look forward to whatever you can share! You've done such an awesome job with this blog- it's been great to know that others cherish these children's literature gems, too! Many thanks for all your sharing thus far and congratulations on the new job. I can't wait to see what new surprises and discoveries you'll be unveiling for us in the future! Oh, and the New York Review Children's Books are the Best! Am I ineligible as a frequent contributor? I hope not. I love NYRB. Happy Anniversary! This would be great to win! This is an awkward reply...congratulations on your five years and condolences for losing your Grandmother. Life does move fast. I haven't been reading very long, but your blog is great! I'd love to win your giveaway! Pick me, pick me! :) Congratulations on your new job!! What a lovely giveaway! Thanks for the chance to win such fun books! Congratulations! 5 years and a new job - that's amazing! Congratulations, and thanks for continuing to share with us on Mondays. Your blog is fantastic and such an inspiration to me as I raise twin book lovers! Congrats on the new job. I guess the giveaway is for US residents? If it's open to European readers of your blog, please count me in. Good luck in your new life, and thanks for all the reviews, I've discovered many books that I wouldn't have discovered otherwise. All the best with the new season of life you are stepping into! Congrats and thanks for this great blog. Congrats and thanks for this great blog! I will be missing more regular posts but your new job sounds great. Congratulations! Although, I will miss your almost daily posts. I was thrilled to have found you - you have reminded me of so many of my childhood friends and memories. A win for your publisher. Hope you'll be working on Children's titles. Amazing finding your blog, can't wait to share with friends. Keep up the great work. Yay for leaving the domestic jungle! Hope you enjoy your new work... wonderful!!! Congrats on the new job. Please keep this blog up. I "mine" it constantly for info on books I find. You also validate my vintage kids book obsession. Love your blog. Cheers, Stacy Z. Wonderful book collection. We will all continue with new adventures through discovering new old books! Just dying for Three Ladies Beside the Sea! I love Edward Gorey's work. I've been reading the blog for years! Great job. Congratulation! Keep posting, your blog is truly special. Congratulations! Keep posting. Your blog is truly special. I love NYRBs and their children's books. This a great contest. Love this blog too. I am not sure what is it about children's books that makes me wish for simpler times and days. Hope the sea change suits you too! I love children's lit- great blog. I own several NYRB kids' books, but surprisingly, not these. Also, ahhhhh, Tidewater. My family is from there, and it's always good to go home, even at the sad times. Best of luck to you in your future job. Thanks to this blog, I have discovered and (re)discovered so many wonderful children's books! I am also going back to work after 2 years at home with my son. But I will still come home in time to read him great books before night night. Congrats on your new job! I am also going back to work in another few weeks. But I will still be home in time to read great books before night night. I love knowing there are other moms out there as book addled as I. There are never too many books in a house. Loving your blog. Lots of new-to-me books though I've been a reader all my life. Congratulations on years! Congratulations. I only just discovered this blog about a year or so ago, but I've enjoyed every bit of it. i adore this blog -- thanks for all the posts. congrats on the new step in life! Your blog is a treasure chest. Every morning I open it, wondering what new marvels I will find. When there is no new post, I rummage through the old ones. Thank you for introducing me to scores of fabulous books to share with my grandchildren. (Happily, they live near excellent libraries; otherwise all of my allowance might be spent on picture books.) I send you my very best wishes. i just discovered your page today, and im so glad that other ppl treasure these books as much as i do! Thank you for hosting this give-away. I've just found your blog (via books4yourkids.com) and look forward to reading more. I would love these! Thanks so much for everything you have put into this blog. I love this blog. It's the only one that I continuously check on. Many times I've read about vintage books and then actually find them while I garage sale. Just yesternight my son asked me which book he could get from the library. And I mumbled Roald Dahl and forgot to tell him Mark Twain. Yet, there are so many others to discover. It is a journey. Congrats on your new job and I will look forward to your posts. You have an impeccable website. It feels more like a home that a webpage you cruise by. Congrats on your new job! Wow, Slim Pikins... that's probably the nicest thing anyone has ever said about this blog. Thanks!